3 Nutritious Delicious Noodle Replacements! Do you love finding foods & recipes that taste great, help you have more energy, and load your hard-working mind & body up with nutrients? Who wouldn’t?! This week I’m sharing with you 3 AWESOME noodle replacements and quick, easy recipes to try them in. Why substitute for wheat, rice, or gluten-free pastas at all? Well, there’s A LOT of good research and books on this topic. The quick and dirty reasons are that grain-based pastas are all high in starch (makes it easy for your hormones to go from fat burning to fat storing and for your energy to spike and then crash). Grain flours also tend to be inflammatory, difficult on digestion (may lead to leaky gut), and displace more nutrient-dense foods in your diet (they pack a big calorie punch, but fall short in delivering the nutrition your body needs). Overweight, fatigued, achy, skin issues, autoimmune disease, and allergies or infections. It’s more common than you might think and your food choices make a huge difference in whether you have it. So wouldn’t you agree that it’s worth trying some alternatives? Here they are! Zoodles, Caboodles, and Poodles! To get the long strands that look like noodles (zoodles and poodles), you’ll need a spiral slicer. This is the one I have (inexpensive and is holding up great over the years). You can also use a veggie peeler (takes longer and different shape, but it works). 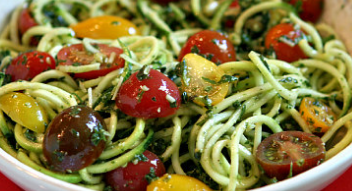 Zoodles are made with zucchini and are high in potassium, Vit C, Vit A, folate and provide some great fiber too. Zucchini Pesto with Grilled Chicken. Love it! Caboodles are made with cabbage and are a great source of Vit K, B vitamins, Vit C, potassium, manganese and fiber. Bison Stroganoff with Caboodles. Yum! Poodles…don’t freak out! We’re talking about parsnips not pets! Parsnips are high in fiber, B-vitamins, Vit C, calcium, iron and anti-oxidants (protect your cells against damage). 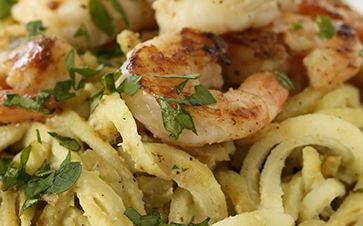 Parsnip Noodles with Lemon Basil Cashew Cream Sauce and Garlic Shrimp. Omg! Here’s a bonus noodle replacement and recipe you’re sure to love! 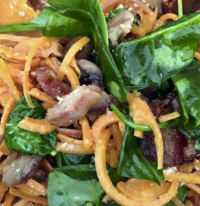 Hearty Sweet Potato Carbonara. Instant hit! Recipe here. You’re going to love swapping these veggie noodles out for traditional pasta and your health will thank you! Enjoy! http://choosinghealthnow.com/wp-content/uploads/2016/05/apple.png 0 0 admin http://choosinghealthnow.com/wp-content/uploads/2016/05/apple.png admin2017-01-23 11:21:522017-01-23 11:21:523 Nutritious Delicious Noodle Replacements! Our family has been grain-free for many years. Quite a change since I grew up with a loaf of french bread in one hand and a fork filled with pasta in the other. One of the staples that I’ve enjoyed replacing traditional pasta with in a variety of recipes (like beef stroganoff!) 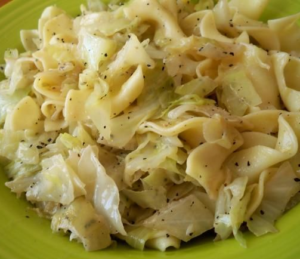 is cabbage noodles. And they are soooo easy to make! Slice up a green cabbage so you get strands. 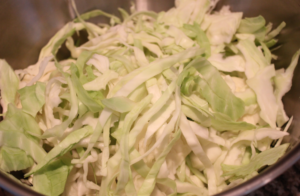 Easiest to cut the cabbage in half, remove the stem and core, lay down on the flat side and then slice into strands of desired thickness (usually about 1/2 inch thick) from top to bottom. Cook on low-med heat in the healthy fat of your choice for about 8-10 mins until tender (coconut oil, ghee,butter, duck fat, and bacon fat are all great). Delicious as a side dish or topped with your favorite sauce. Enjoy! http://choosinghealthnow.com/wp-content/uploads/2016/05/apple.png 0 0 admin http://choosinghealthnow.com/wp-content/uploads/2016/05/apple.png admin2017-01-23 10:31:312017-01-23 10:31:31Cabbage Noodles=Caboodles! Must have tools for getting healthy, wealthy, and slim! Last week you discovered the first key to better health & happiness so you can look and feel awesome. Click here if you missed it. Today, you’re going to learn about the 2nd key called define. This is your moment to get clear on what you deeply desire for yourself and your greatest asset: your health. Before we jump into that, don’t miss your last chance to hear my interview on “Unlocking health & beauty: Breaking up with stress so you can look and feel your best!” in the free HEALTHY, WEALTHY and SLIM summit!! Check it out! Okay back to the “define key.” This is what allows you to form the best plan to get you the results that you want! Many of you have shared how you’ve used the guidance of these newsletters to guide your vision for getting clear on what you want for yourself and your health and why that desire is so important to you. This is your WHY. If you are feeling stuck here, email me right now so you can move forward. 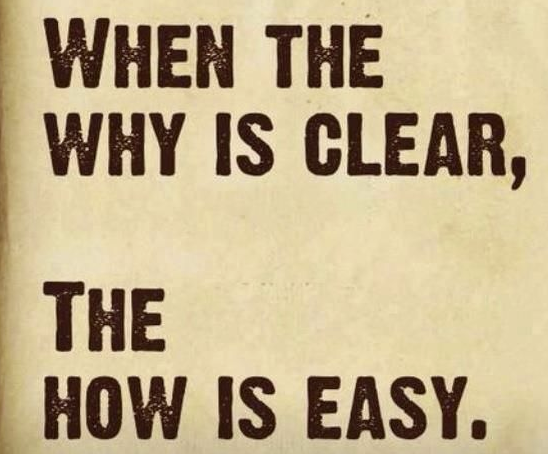 Your WHY, what will pull you forward toward your goal no matter what, is what trumps willpower. Every. Single. Time. So make sure you don’t skip this step! Post your WHY someplace that you can read it and feel it every single day. Next time, I’ll reveal how to use the 3rd key to take smart action toward what you deeply desire for yourself & and your health. Until then, go forth and be AWESOME! http://choosinghealthnow.com/wp-content/uploads/2016/05/apple.png 0 0 admin http://choosinghealthnow.com/wp-content/uploads/2016/05/apple.png admin2017-01-11 06:32:362017-01-10 11:32:50Must have tools for getting healthy, wealthy, and slim! Reflect, define, act. These are 3 keys to better health & happiness that are vital to reaching your goals so you look and feel awesome. I’ll be discussing how to use these keys over the next few weeks with you. Today we’ll explore the first key: reflect. Holidays often bring us clarity of our greatest health obstacles as they are a time that many of us experience additional stress (travel, family dynamics, high expectations, dietary temptation). As you read on, consider this: every obstacle has a solution and you don’t need to keep hitting your head against a wall or feeling stuck and unhappy in your body. Progress begins with reflecting on what is and what isn’t working for you. While it’s fresh in your mind, how did you support yourself over the holiday season? To make this really easy, let’s look at the 4 basic areas of self-care. Food-what particular foods and meals worked well for you (satisfied your hunger for 3 or more hours and reduced your cravings)? Rest-how did you ensure you got enough sleep (7-8 hours each night somewhere between 9pm-8am)? Movement-which ways did you move your body that felt good? Which types of movements made you feel like you were getting stronger, especially your challenge areas (for example, core, flexibility, physical endurance, or strength)? Managing stress-how did you lower your worry, frustration or overwhelm? Did you have some tool that you could use every day whenever you felt these emotions bubble up that was helpful? Your answers reflect your current tool box. These are the tools you are using to make progress toward your health goal(s). If you are making the progress you desire, then your tool box is perfect for you. If not, you may need to add some specialty tools. Let’s keep going! Over the last 6 weeks, what did you stop doing or do in excess…do any of these ring a bell? Did you stop working out, overeat or eat foods that push you further from your goals, not take time for yourself, eat or drink to numb out? Taking a moment to reflect on your successes as well as your “pitfalls” is how you make progress. Making progress is what keeps you motivated and has been repeatedly shown in studies to lead to greater happiness. It’s when you feel like your effort doesn’t make a difference in how you look or feel that you feel helpless. So now that you’ve reflected on which self-care tools are working for you and which aren’t, pay attention this week to using the best tools in your tool box (eating those foods that are most satisfying to you, getting enough sleep, etc). Next week, we’ll dive into the next key and define what you deeply desire for yourself and your greatest asset: your health. Until then, I’m wishing you a very Happy New Year! P.S. Here is your personal invitation to unlock your Healthy, Wealthy & Slim self! Starting soon, you can join me and 21 other experts as we share life changing information with you! It’s a FREE video interview summit called HEALTHY, WEALTHY and SLIM!! This event is designed to support you to build and sustain an INCREDIBLE life helping yourself and others achieve ULTIMATE health and weight loss success! Grab your spot now!